Buddy, can you spare a few acres? Ah, golf courses seemed to have achieved a standardization almost comparable to the dimensioning of football fields, baseball diamonds and Olympic swimming pools. Eighteen holes with a total par of 72, at least 70 or 71, anyway. 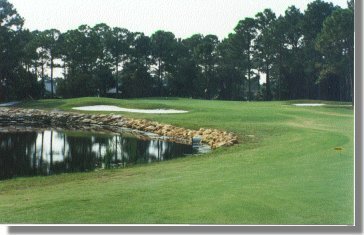 Usually consisting of four par 3 holes, eight or more par 4 holes and up to four par 5 holes. Today more than 7,000 yards from the back tees appears essential for any “respectable championship course”. Certainly they are minimums for obtaining widespread recognition and a chance for ranking as a “best new course”. Other results seem commonly to be fees of at least $75, rounds of five hours or more and the general belief that a cart is necessary to get around. To a developer these easily take at least 160 acres, financing of five million dollars for the course’s construction alone and then an annual maintenance budget in the neighborhood of one million dollars. These scrap many a proposed golf project, depriving their developer and future golfers the pleasures a course could have brought. All new projects don’t have to suffer due of these excesses. There are ways to decrease the size of a golf course and so proportionally cut costs and playing time. Any idea of deviating from the current model, though, could make some golf traditionalist immediately recoil in horror. “Haven’t courses always been that way” or “that’s how golf courses were meant to be”, they might say in unison to change. An often overlooked fact is that the Old Course in St. Andrews originally had 22 holes and to this day still has just two par 3 holes. On this side of the pond from Scotland, a significant statistic is that of the 16,743 golf courses in the U.S. at the start of the year 2000, 1,894 or 11.3% have a total par of lower than 67 and length of less than 5,200 yards for 18 holes or equated to 18 holes. Every golfer knows at least a few interesting and enjoyable nine-hole courses. So there are precedents for other than long courses with a neat 72 par. Naturally most new courses built won’t by a long shot or for a long time be “non-conventional”. Golf courses can be smaller by having shorter holes or lower total par or fewer holes. All three can be combined to shrink the size of a course even more. Again, will doing any or all of these cause some of the game’s purists to scream loudly? The following example score card shows how smaller could be done. Yet with several sets of suitably spaced tees, such a course would require golfers who hit a golf ball different distances to each use a balanced distribution of their clubs. This is indicated in the Clubs column in the score card. The course is a 12 hole loop instead of the conventional 18 holes. There would be four tee shots with a driver instead of the typical 14 and no par 5 holes. Drivers and par 5s both strongly favor long hitters and mean lots more land for fairways and their maintenance. Also the increased number of par 3 holes doubles the chances per round of golf’s most exciting shot - a hole-in-one. One description could be that it is a compact course requiring all the clubs in a golfer’s bag. No matter what the length, par or number of holes on any golf course, certain other essentials are critical to its popularity and success. These include a suitable site location, sound routing, certain level of maintenance, efficient operation and effective marketing. The holes should be sufficiently challenging, have character, be varied and fit well into their surrounding landscape. Poor turf turns golfers off, no matter where they are playing. But a course doesn’t have to be like Augusta National in conditioning or layout for give golfers a good walk unspoiled. So could there be a viable alternative to the expensive “standard course” that most experienced golfers have come to expect? Any acceptable new kind of golf course must be geared to the game of many if not all golfers, require each to use the full range of their clubs and be faster to play. For developers, owners or operators an innovative course should be able produce more rounds per day. Where space allows, this could be by a smaller second course next to a big one. The two would compliment each other. This could all be a course for progress. One element of progress is not just going on with more of the same simply because it’s thought that things have always been done that way and always should be.